A videogame made as a second year degree project by Middlesex University BSc Computer Science graduate Saif Hossenbaccus looks set for big things, after more than 3,000 gamers downloaded it from the Xbox Live platform. Android, iPhone and PC launches of the arcade-style space shooter are also in the pipeline, meaning the number of people playing it could soon explode as quickly as one of the game's alien enemies. Generic Space Shooter takes the traditional format of a top-down 2D shooter, challenging users to survive for as long as they can in the face of an ever-growing onslaught of alien spaceships. "The game is quite tough," said 21-year-old Saif. "You only have three lives before you die and the enemies get harder all the time, but the longer you play the more points you get as the game rewards you for staying alive. "I called it Generic Space Shooter because that's what it was. As I developed it further it got a bit more complicated and it's not really a generic space shooter anymore, but I decided to keep the name for comedic purposes." For his undergraduate dissertation, Saif investigated high-resolution gaming. 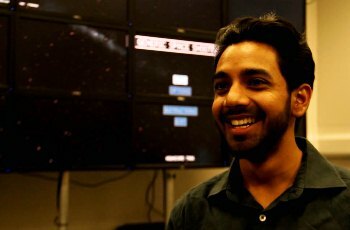 Supervised by Middlesex researcher Dr Chris Rooney, Saif created a version of Generic Space Shooter that would play on the Computer Science department's custom-built Powerwall – a 66 million pixel, wall-sized display. Yet despite his previous experience developing software, including a programme which enabled the NHS hospital where he worked to more efficiently manage their staff rotas, developing a game posed completely new challenges. "I'd had experience programming, but making games is completely different," he said. "You need art, music, animations - it's completely different. So I put my head down and learned how to do it. "I started off just making a regular top down shooter a bit like Space Invader, where your space ship is fixed and the enemies appear from the top. But I wanted to do more than that so I learned how to work with vectors so that I could make the ship capable of moving around the screen." After submitting the game for his coursework, Saif spent the summer before his third year developing the game further so that it was capable of being published on Xbox Live. "The course made me really intrigued about how to go about making games, so after gaining an insight into how to develop games, I decided in my third year that I really wanted to make it into a proper game." During his final year, he created versions that could be played on PC, iPhone and Android devices and also set about investigating ways of publishing the game so that others could play it. Popular game distributor Humble Bundle, which allows users to purchase packs of games at a price of their choosing, has accepted the game and is now selling the game. Generic Space Shooter has also been placed on Steam Greenlight, giving its 75 million users the chance to vote on whether they want it to be made available through the platform. "My main goal right now is to get Generic Space Shooter on to Steam because it has so many users so if I got it on there it would be fantastic, but I also want to release it on the mobile platforms and see how well it does," said Saif. "Ultimately I have just made something that I really like, so before I move on to making my next game I want to release it so that hopefully other people will enjoy playing it as much as I did."